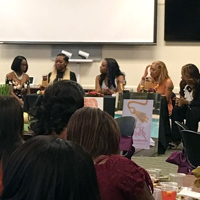 Webster University's Orlando campus location hosted a "Positivitea Mentoring and Networking Brunch" to connect recent graduates from Webster and Florida Agricultural and Mechanical University with successful women business leaders, who will serve as mentors and advisors to these young professionals as the navigate their new career paths. More than 150 women attended and toured the Webster location in downtown Orlando, which the campus intends to make an annual event for Webster University alumni. The mentors will follow the graduates for a year and be there as counselors, advisors and friends. Next year, several of the teams will return to share reflections and discuss how this program has helped them. leaders sharing insights on their career paths. The conference was chaired by Webster Orlando's recruitment coordinator Deborah Straubinger, Webster alumna Cherlette McCullough, LMHC, (MA '16) and attorney and FAMU alumna Miranda Jackson. The program included a panel of lawyers, licensed mental health counselors and business managers who discussed their experiences as a new graduate starting out in business, and a Q&A session about networking, using social media, budgeting, work/life balance and creating business plans. FAMU, based in Tallahassee, also recently joined Webster's WINS network for expanded study abroad opportunities.